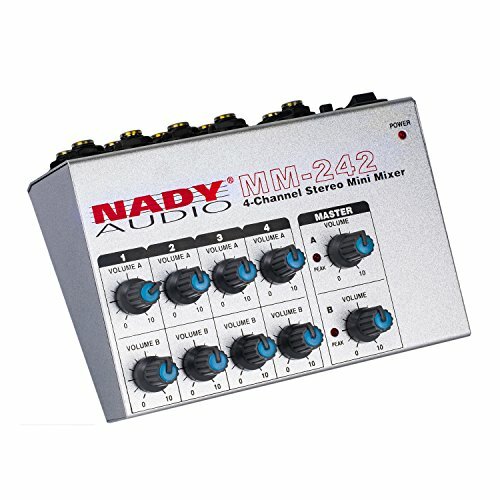 The Nady MM-242 allows you to easily combine mono or stereo signals together and adjust their relative volumes. Ideal for DJ equipment, synths and guitar rigs, studio, stage, the MM-242 is a great tool to have around everywhere. Mono/stereo mode selector switch determines whether all 8 inputs are mixed to both 1/4" outputs or are preserved as stereo signals, so you have greater flexibility and mixing options. Connect the ¼” outputs of this little workhorse directly to your PA or recording device for ultra-clean audio. Eliminate the need for bulkier, more expensive mixers, and take the MM-242 anywhere with you with its 9VDC operation using either a 9V alkaline battery or the optional PAD-1 AC/DC external adapter. Eight mono ¼" inputs with individual volume control and two ¼" outputs with Master Volume Controls.